Persephone. An feisty spayed female looking for attention. Bevan. A 1 year old unaltered male. This handsome boy is looking for room away from his siblings where he can be himself. ​ He likes them well enough (so far) but a little space would be nice. Scooby. ​ A 2 year old unaltered male. This fast little miracle pig is looking for a home with space to run. Sal(ly), ​This adorable boy is looking for a new friend to hang out with every day. Gavin (behind) and Rosie (front). Rosie may only have one eye, but that does not stop her and Gavin from living their life to the fullest. Our adoptables page is under construction. Keep up incoming pigs and other news on our Facebook page! Can't adopt, but want to help out the pigs? Donate today! 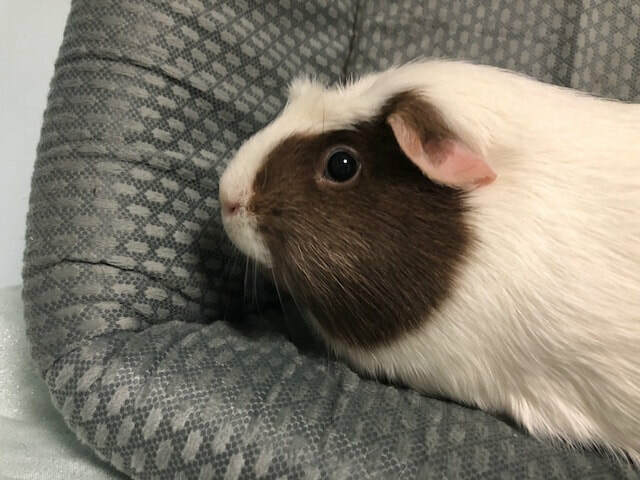 There are usually guinea pigs who will be up for adoption as soon as they're old enough, out of quarantine, have recovered from their spays, or are medically sound. Follow us on Facebook for updates and submit an application today to get to meet them before anyone else!